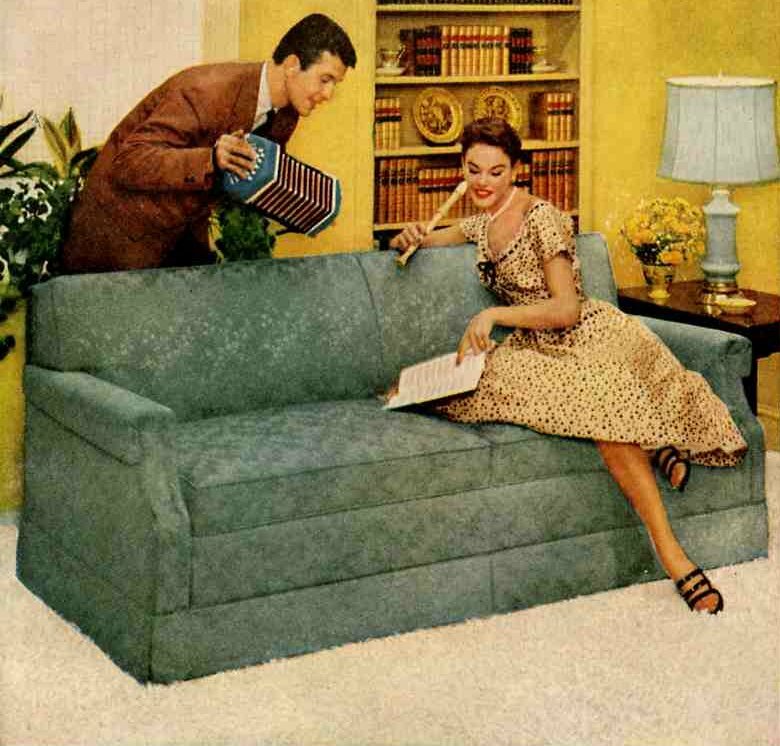 Home » By the Decade » 1950s » Maddy123 inspires a new obsession: Accordian accessories! be sure to click to enlarge both photos! When I ran the post including the Simmons hideaway a few weeks ago, I have to admit, I didn’t even notice that the couple was playing musical instruments. Cute 50s ones, too – an accordian and a recorder. Touchee, Maddy123, for pointing it out! 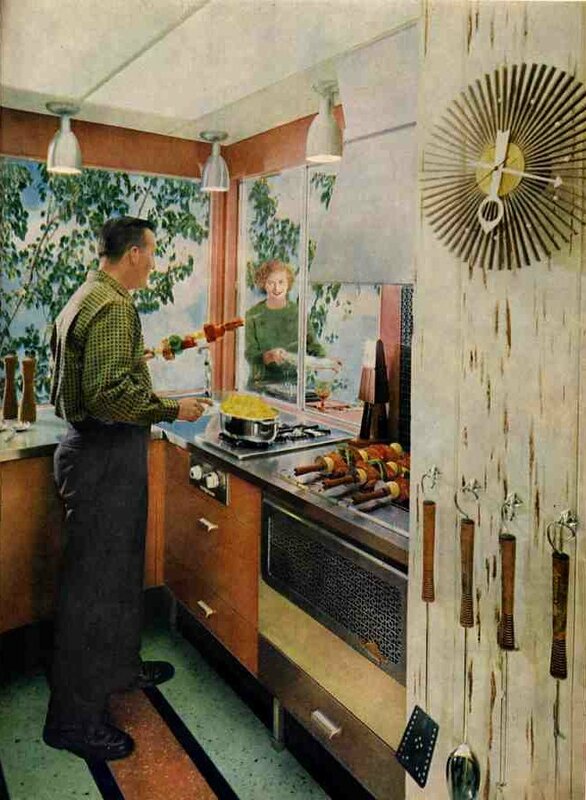 Now, you have inspired a new obsession: Hunting for postwar interiors photos featuring accordians and the like. RetroRenoReaders: Send in any that you spot — we’ll start a flickr group, too! 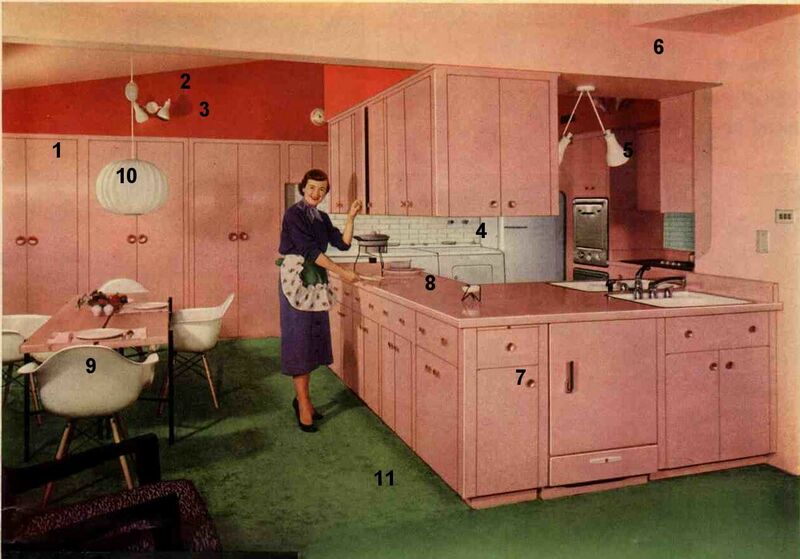 Isn’t this 1957 kitchen great? You can see how ‘open concept’ was starting to take hold. 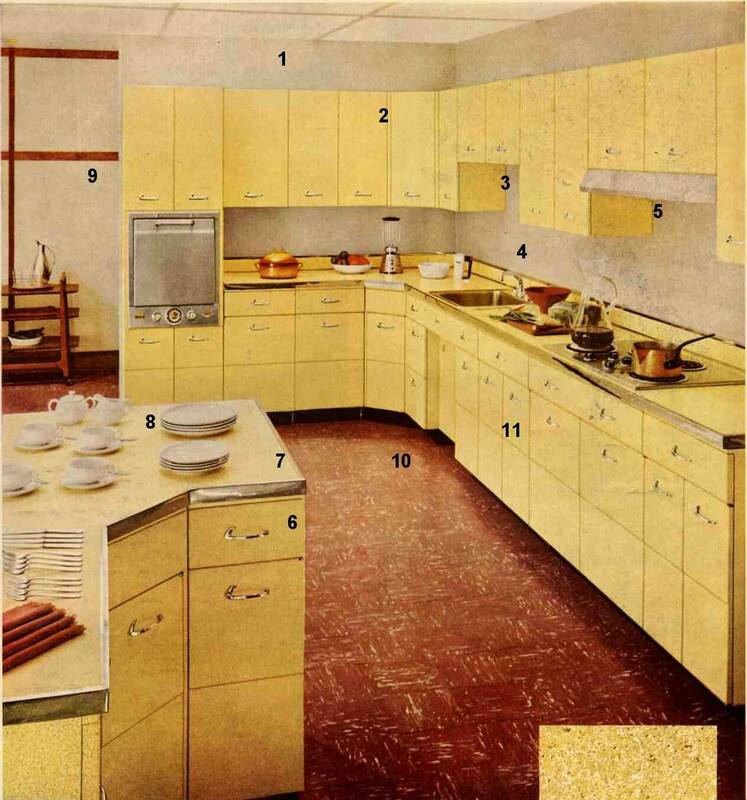 I love the birch cabinets, the built-in eating area and fiberglass chairs, the barkcloth pinch pleats, the brown VCT floor, and the Monsterosa plant and George Nelson style bench in the foreground. And of course, in addition to Joey on the accordian, we get an indoor barbeque for Billy! Sweet scene! 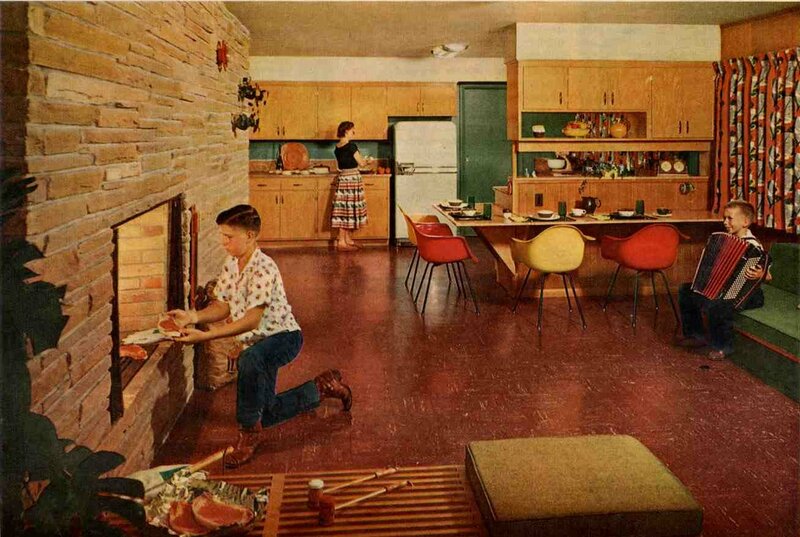 And I guess ’50s dad is at work while they prepare dinner and listen to the music?? 50s dad is staying late at the office “working” with Mitzi, his new secretary. Then he’s catching the late train out to New Rochelle where mom will pick him up at the station in their two-tone Pontiac station wagon. On another point, I remember those salt ‘n peppers on a stick shakers for bar-be-cueing. Great detail catch, Femme 1! I didn’t notice the S&Ps on a stick – in the foreground on the bench – and frankly, would not have known what they were even. Holy cow, I gotta have some of those! Those are salt and pepper shakers? I thought they were some sort of percussion instrument to accompany the accordian. What I notice is how those pinched pleat draperies in the snappy print really bring some life into the rather austere room. 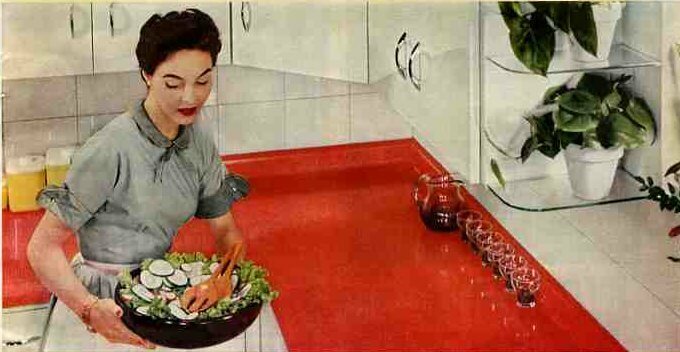 Well, there also is Mom’s flashy skirt — hope it catches Dad’s eye.